How Home Depot, Tesco, and others are using mobile technology from Motorola to address showrooming, line busting, re-engineer replenishment, enhance customer experience, and more. It is obvious at first glance that Motorola’s new SB1 smart badge is something different. First is its small form factor (c. 3.6” X 3.2” X 0.5”), roughly the size of an employee name tag. The SB1 uses an E-Ink display and other power-saving techniques to squeeze 14 hours of operation out of a single charge. The SB1 also has a built in accelerometer so that the badge displays correctly while hanging around the associates neck, then the display flips 180˚ when the associate flips it up to view the screen (see Figure 1). Motorola says the device needs very little training, which is of course a must in the high turnover and highly seasonal retail environment. It seemed to me that many of these clever design features are an outcome of what I refer to as a ‘purpose-driven design’ process. Motorola is not just making a general purpose device, but rather tailoring it to a very specific environment and purpose. Although the SB1 won’t ship until the end of this year, Motorola is already on their third iteration of design based on feedback from pilots with companies like Tesco. For example, their pilot customers said the device must last through two shifts without being recharged, hence the E-Ink display and other design decisions to get the long battery life. The SB1 is highlighted in this excellent video by Tesco’s CIO, Mike McNamara. The video also shows Tesco’s use of a number of other technologies (from Motorola and others) including self-scanning (using Motorola’s Personal Shopping Assistant), Motorola’s video analytics (which Tesco dubbed their ‘Broccoli Cam’ as it monitors their produce section), electronic shelf-edge labels, kiosks, augmented reality, and more. Motorola asked sales associates what they most needed and the associates said: 1) price checking, 2) know inventory levels in the front and back of the store, 3) communicate in real-time with other store associates, and with the warehouse to have something delivered, 4) more efficient task management to reduce the time spent on stocking and other mundane tasks and free up more of their time to help the customer. Hence the SB1 is designed to serve multiple purposes. It’s a name tag, barcode scanner, alerting system, voice communicator (using the optional push-to-talk VoIP1), inventory and price checker, and task manager. The store associate can receive alerts anywhere, whether triggered by a customer request (e.g. pushing help button in dressing room) or video analytics noticing an item that needs replenishing. It can be integrated with all variety of workforce management tools and provides the means to see who is where, who is available, and push tasks to them. One of Motorola’s goals for the SB1 is to get one in the hands of every store associate. To reach that goal, they have priced it at around $500 list, of course considerably lower in volume quantities. Most associates don’t need a full-featured solution with mobile checkout, color screen, etc., so this makes sense. The SB1 may become anotherexample of R&D being leveraged across business units and industries. Though developed for the retail environment,Motorola expects this same device to have applicability in a number of other sectors and settings such as hospitality, healthcare, and manufacturing (assigning tasks on the plant floor). Retailers are showing interest in different approaches to line busting and improving their customers’ experience, including mobile self-scanning by customers and mobile POS2 for use by associates. Motorola’s Personal Shopping Assistant (MC17) lets shoppers scan items into their basket (as shown in the Tesco video referred to above). In addition, it can show promotions and cross-sell suggestions. The Personal Shopping Assistant is a mature product, having been used in the field for over five years. It has seen success in Europe but has yet to really take off in the US, though Motorola does have a couple of pilots going in the US. 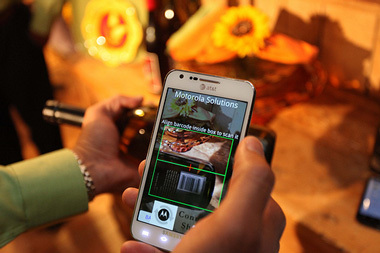 At the NYC event, Motorola also demonstrated an app that customers can use on their own phone to scan items. The customer downloads the app from the retailer. When they enter the store, the customer scans a 2D barcode identifying the store they are about to shop in. As they shop, they scan each item, using the phone’s camera to take a picture of the barcode. This approach is considerably slower than using the Personal Shopping Assistant device, so it doesn’t replace the PSA, but is useful if the customer just wants to buy a few items. The app can do other things, such as let the customer enter a shopping list before arriving. Then when they enter the store, the order of the list is re-sequenced to match the store layout. If the shopper finds things more quickly and efficiently, they have more time to browse the store. The app also suggests cross-sell items, based on what is in the shopping list. 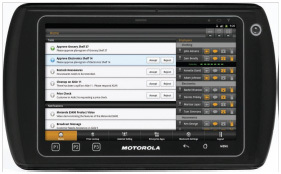 Motorola offers a mobile POS solution on its hardware using software from their partner, Stella Nova. Best Buy Canada will do a four store pilot of this in August. They had tried to do mobile POS with 2.4 GHz devices but had too much interference with the electronics in their store. The Motorola handheld uses a different frequency (5 GHz) so they expect to provide more reliable results. One of Motorola’s customers is trying something even more radical—a single store pilot to see if they can actually replace (not just augment) most of their traditional checkout altogether. This technology has allowed Home Depot to reengineer their replenishment, freight flow, and most importantly customer service. This includes Mobile POS to do line busting and inventory tools to enable associates to help the customers find what they are looking for. Smith said that associates now have the tools to know whether inventory is in the building, at another store, at the DC, or in transit, and can avoid customers walking out empty handed. She said Home Depot has seen improvements in their Net Promoter Score. Because of this success, Home Depot is adopting the EWP model (calling it ‘First Phone Junior’) in order to improve service more broadly. These new devices will be in every Home Depot store by end of 2012. The other day, the Amtrak train ate my Bluetooth headset (it fell between the seats and was unretrievable after much effort). I found the replacement I wanted on Amazon but went to Best Buy to actually look at it before buying. I ended up buying from Best Buy for $30 less than their marked price, by showing them what I could buy it for at Amazon (with free shipping). Retailers hate shoppers like me, but they realize that ‘showrooming’ is here to stay and they have to learn how to address it. Home Depot’s Jennifer Smith said that store associates are their most important weapon against showrooming. If the associate can solve your problem, have a conversation, and hear about your day, those are things Amazon can’t do. Home Depot is trying to educate their associates to be able to better help customers as well as empower them to make that emotional connection with the customer. But with high turnover and range of skill sets, it is a challenge to turn minimum wage workers into knowledge workers. Actually, Home Depot’s associates range all the way from the minimum wage worker up to a master plumber or electrician. So Home Depot wanted a tool to span that full range without requiring training. Smith said tools like the MC75 can provide an intuitive interface that is similar to the smart phones that most workers are already using. This will give them immediate use of the tools. I walked away from Motorola’s SoHo retail event impressed not just with the breadth of their products, but with cohesiveness and integrated nature of their strategy for retail. They brought together a complete story, with a clear understanding of the role they play in the retail setting. They particularly excel at working with their customers to develop purpose-specific devices that really fit the needs of the job at hand. A major challenge for any hardware provider is that hardware tends to quickly become commoditized. It’s a tough business that just gets tougher every year. So hats off to Motorola Solutions for aiming to provide not just devices, but (as their name implies) real solutions to retailers’ urgent challenges.